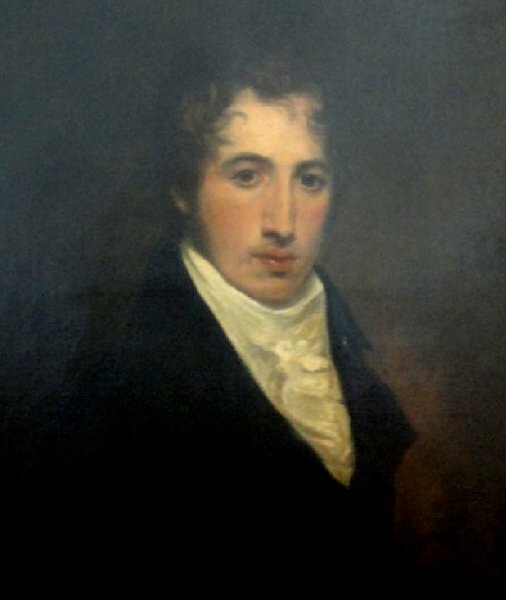 Francis Theophilus Robins, born in 1787, was the only son of Thomas and Marianne Robins and his date of birth, from his portrait below, would indicate Francis was born shortly before his father, Rev Thomas Robins DD (d1812), a minor canon of Bristol cathedral in 1788 and Master of the Grammar School of St Mary Redcliffe, moved to South Petherton to become its Vicar. From his father's will we know that Francis had three sisters. In 1805, Francis was articled for five years to the law firm of Edmund Batten and John Batten. On 9 December 1813 Francis married Elizabeth Proctor Upton (1791-1859), the daughter of Yeovil solicitor George Proctor Upton (1763-1827) and Eleanor née Leach (1761-1848). Francis and Elizabeth were to have at least five children; Marianne (b1814), George Upton (1816-1895), Frances, Eleanor (b 1821) and Florence (b1827). Francis and Elizabeth lived initially in South Petherton where Francis held land. The parish records of South Petherton record that Francis held the position of 'Grass Hayward' there in 1827. A parish position, the Grass Hayward's duties included inspecting the hedges and fences of the parish, tending fields set aside to produce hay and also to impound stray animals. The position was also known as the Field Master. It is almost a given that Francis worked in his father-in-law's law firm, most likely before his marriage but certainly afterwards. 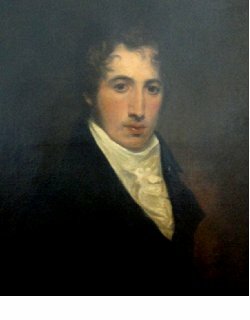 After the death of George Proctor Upton in 1827 Francis became head of the law firm. It would appear from the census records that when Francis moved his family to Yeovil they lived in the house next door to his father-in-law (which was also the offices of the law practice) in Reckleford - at this the name of today's Market Street, which was also known as Rotten Row. In 1831 there were riots in England when Parliament decided against reform to give Britain's industrial cities and towns better representation. Many of the solicitors in Yeovil were active anti-Reformers and had been professional election agents of Lord Ashley. Consequently these were the first to be singled out by an angry mob on the night of Friday, 21 October 1831, in what was to become known as the Yeovil Reform Riot of 1831, who attacked the home of Francis Robins as well as the homes of Edwin Newman, William Lambert White, John Slade and Edwin Tomkins. The following is an extract from the 5 April 1832 edition of the London newspaper, True Sun, reporting on the trial of the rioters at the Taunton Assizes of 3 April 1832 "Edward Dodge, Edward Miller, John Curwood, Richard Marks and John Baker, were indicted for having riotously assembled and begun to demolish the house of Francis Theophilus Robins. Mr FT Robins, an Attorney of Yeovil, stated - "On Friday, the 21st of October, soon after ten o'clock in the evening, I saw a mob, consisting of several hundreds, coming down a field in which my house stands. A brick wall, five feet high, divides my garden from that field. They pushed down the wall. Mrs Robins was so alarmed that she insisted on going to a cottage near. I heard the destruction of the windows and doors of my house, apparently accomplished with stones, sticks and bricks. The mob continued there two hours. The windows and shutters were completely demolished. Every window in the house was destroyed. The damage done amounted to more than £300 (about £24,000 at today's value)." Corroborative testimony was called as in the last case but the prisoners were all acquitted." In the South Petherton Poll Books for both 1832 and 1834 Francis was listed as living in Yeovil but was listed by virtue of owning a property called Dry Hams in South Petherton. In the Somerset Gazette Directory of 1840 he was listed twice; as an Attorney of Reckleford and as an agent for Norwich Union Fire & Life Insurance of Reckleford. (George Upton had been listed in the 1822 edition of Pigot's Directory as an Attorney of Reckleford), Francis was also a member of the Yeovil Vestry. In 1834 the Western Gazette reported "The Lord Chief Justice of His Majesty's Court of Common Please has been pleased to appoint John Batten and Francis Theophilus Robins, both of Yeovil, gentlemen, to be two of the Perpetual Commissioners for taking the acknowledgements of married women, under the Act for the Abolition of Fines and Recoveries, for Somerset." Although not mentioned in this report, the Bath Chronicle noted that John Slade was also included. In the 1841 census Francis and Elizabeth were both listed as being 50 years old (bearing in mind that the 1841 census generally rounded people's ages up to the nearest multiple of 5 if they were aged 15 or more) and living in Rotten Row with their children George, Eleanor, Florence and three servants. Next door was Elizabeth's widowed mother Eleanor Upton, living with Francis and Elizabeth's daughter Marianne and three servants. From their location in the census they would appear to have lived a few doors up from Court Ash. In the Notices of Deaths in its edition of 20 January 1849, both the Bristol Mercury and the Bristol Times and Mirror noted identically "Jan 5, at Yeovil, aged 62, Francis Theophilus Robins, Esq." and the Hampshire Advertiser noted that Francis died "of apoplexy" (that is, a stroke). In the 1851 census Elizabeth, listed as a widow, was living in Rotten Row with her three unmarried daughters Marian, Eleanor and Florence together with three servants. Elizabeth died during the 1850s but it is not possible to tell exactly when since six women called Elizabeth Robins died in Yeovil during that decade. 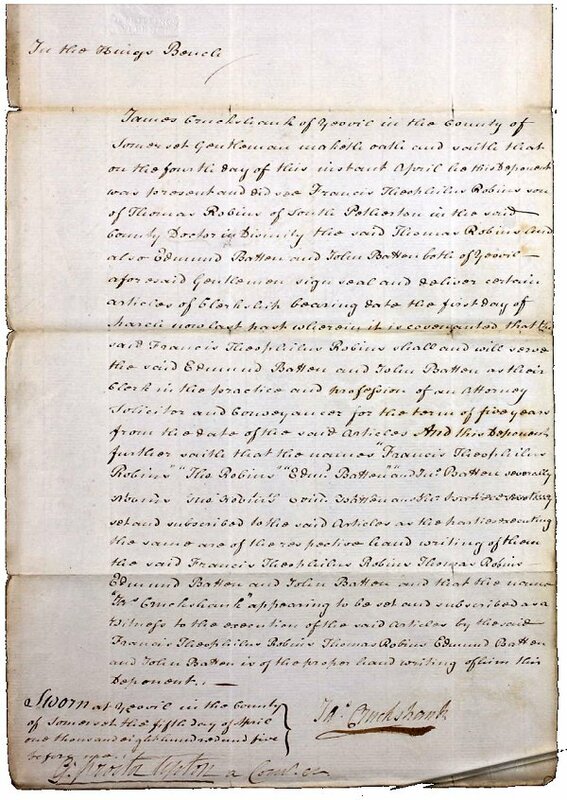 Somerset Records Office holds pre-marriage settlements of Florence and Eleanor, daughters of Francis Theophilus Robins of Yeovil, deceased, to Arthur Burridge of Bridport, Gentleman, and William Hole of Alcombe Lodge, Dunster, Esquire, 1851 and 1856, ¼ of lands in Walcot (tithe nos. 274, 275) and close called Dryhams in South Petherton, reciting the will of Florence Robins of Bristol, widow, deceased. Francis Robins' signature against the Vestry minutes of 29 December 1831. The nameplate on the gilt frame of the above portrait (albeit spelt Robyns) suggesting the date of his birth to be 1787. Francis Robins' articles of 1805. He was articled for five years to Edmund and John Batten. 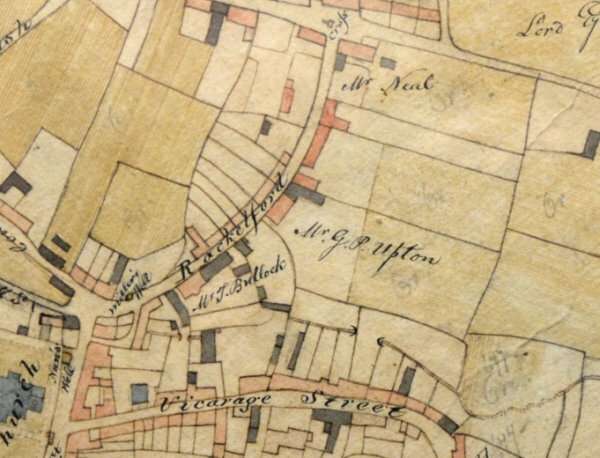 E Watts' map of Yeovil of 1806 shows the home and law office of George Proctor Upton at centre, on the eastern side of Rackleford (today's Market Street). From the 1841 census it appears that Francis lived in the house next door, to the north.